Happy Friday! If you’ve been following me on Insta, I’ve been sharing some of my fall fashion faves from Old Navy! This store is seriously one of my favorite places to shop for all things cozy and neutral and for a short time only, everything in the store is 30% if you order online!!! That also includes some items that are already at a discounted price. Since so many of you loved all the stuff I was sharing on Instagram, I decided to throw together an Old Navy fall sale roundup all the great stuff I either tried on or ended up buying. Now I don’t know about anyone else, but I jump between being an impulse buyer to being almost too cautious. I either buy it without trying it on at all or I keep coming back to it either physically or I stalk it online until I get the courage to stick it in my cart and just do the damn thing! Am I the only one that does this? Lol I dunno. This Textured Quilted Vest is the perfect neutral to keep you looking stylish and warm! It’s cozy enough to wear over a sweater without being too bulky that you’re sweating indoors. This was one of the items I spotted in store last week and posted to Instagram but never bought. Once I heard that it was on sale, I just couldn’t resist! It fits TTS (true to size) and falls right below the waist. 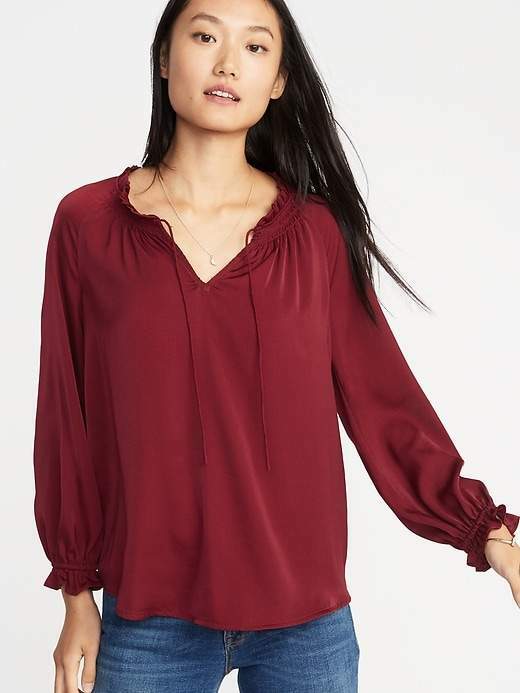 This adorable Relaxed Tie-Neck Peasant Top is seriously giving me life right now. This russet orange color is popping up all over and I am definitely a fan! This top would be perfect to pair with a dark wash denim, white jeans, or leggings. I love the details on the sleeves too. I would probably throw on some cute leopard-print flats or jacket too for some extra character! This Relaxed Satin Poet-Sleeve Blouse is another one I shared to my IG stories because the color is so rich! The reviews are great and I love the cuffed sleeves. This would be perfect with basically anything but it would be especially adorable with a black skirt, tights, and black booties! I’m thinking it may be the perfect outfit for me to wear around Christmas time! 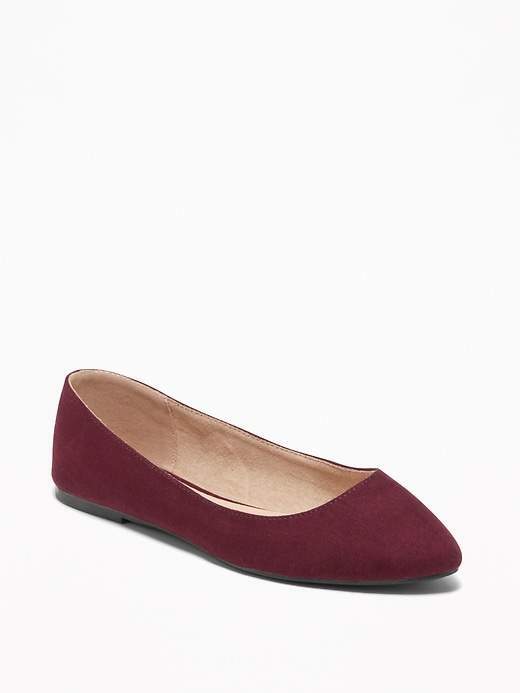 These Pointed Ballet Flats are seriously so comfy and go with almost any outfit! I shared the leopard print ones on Insta and immediately got so many compliments. Scroll up to see the leopard print flats in action! And last but not least, this Moto Jacket is so warm and would be perfect to wear over athletic clothes to the gym or running errands or with jeans and boots! 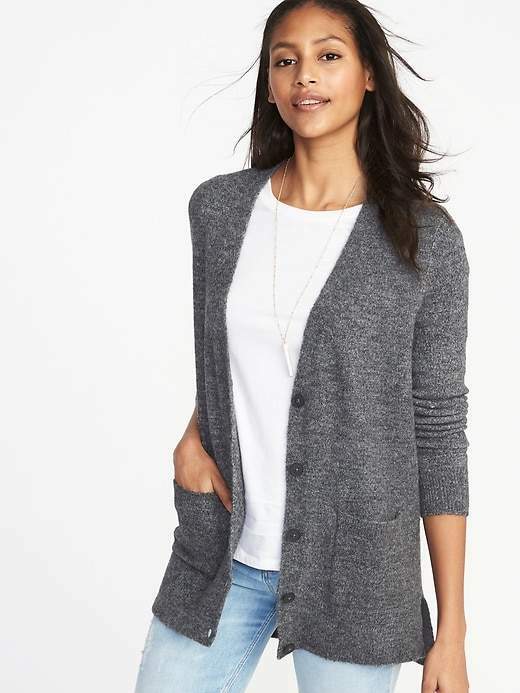 It’s a super versatile jacket at a great price too!